Kate Iturralde and Gloria Iturralde’s “The Yellow Cake Genie.” “The Yellow Cake Genie” is the true tale of one miner and his family who found themselves part of a human experiment conducted by world leaders during President Harry Truman’s administration. A crew of New Mexico miners had been handling a radioactive poison-uranium ore without any warning of the hazards of uranium and radium poisoning. 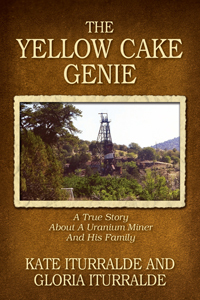 Written by the miner’s widow and daughter, she describes how the government failed to protect these citizens, deliberately put them in harm’s way and changed New Mexico forever.